My new coffeemaker, that is. Once we examined closer, we found that there was a gaping hole (about an inch wide! how did we miss it?!) on the bottom front side of the glass carafe. Normally I would just replace the carafe, but it’s an old machine and a weird brand and model. Meh. I was just trying to clean the water holder section without white vinegar this week….time to just spend a little money and get a pristine brand new one. So, time to research at walmart, Target, and BB&B today. I’ll pick up something tomorrow. This entry was posted in coffeemaker and tagged coffeemaker on October 13, 2017 by Silver Willow. Not good about the counter and floor. That's bad! Not a great way to start out the day, but if that's the worst that happens, it's still a good day in the grand scheme of things. 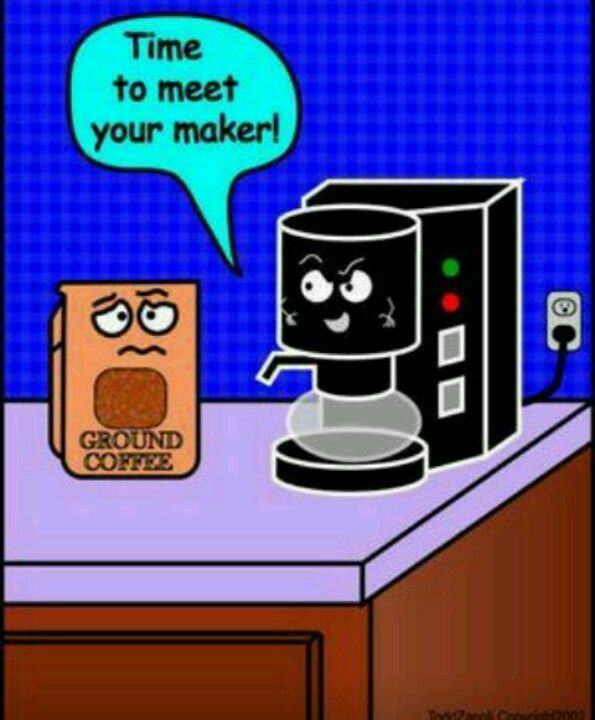 Have fun deciding on the next coffee maker. The lack of coffee would be devastating, SW.
Well, at least I'd only made the equivalent about about 1.5 cups, so it could've been MUCH worse. 😉 Thanks! Yep it's time! It certainly justifies getting a nice new one! I think they deliberately make carafes irreplaceable by tweaking the machines each year. Have fun picking out the new one. Now to Google Gloria Jeans buttered toffee decaf. See we Brits are peasants and most of us drink instant coffee. One scoop in a mug, no mess and no drama. I only drink decafe too. I hope you find a beautiful replacement. Coffee spills are THE WORST to clean up! You'll probably be finding dregs for days. I hope you find something you life. I seem to go through a lot of coffee makers. My husband used to say I could break anything made out of glass just by walking into the room. Hope the coffee didn't stain your floor. Our coffee maker is ancient, about fifteen years old, but still going strong. We switched to Tasimo some time ago. Since we each only have one mug per day, I don't feel that we are being too environmentally unfriendly. funny though how 1.5 cups can seem like an ocean when we have to clean it up! plan on it today, thanks! ugh to instant coffee. sorry. Since I can't handle caffeine, I drink coffee for taste. It has to be a quality decaf or I won't bother. And/but thanks! there were a few dried drops when I got home…but it seems mostly ok. thanks! it doesn't seem to have. fingers crossed! it was in a pretty dark corner of the tiny kitchen, so I'm hopeful. I have a travel 'mug' size of coffee each morning. Glad you love the Tasimo!! I think I have. Monday will be the test. I'm sure it will be fine. 🙂 Thanks! Rick has had those issues. All he wants is a coffee maker that makes coffee. Not Cappuccino, latte, espresso. Just coffee. Three to four cups, though he's probably only normally do two. They're harder to find than one thinks! There was quite a large selection at Bed, Bath & Beyond. Hope he finds one he likes!